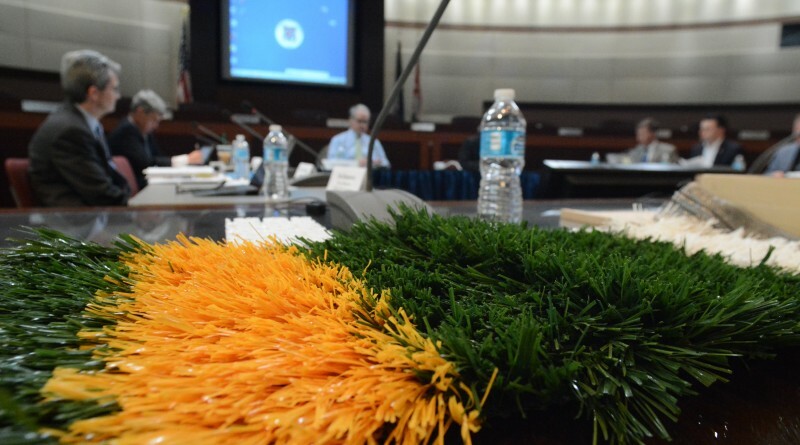 The Board of Supervisors on Tuesday reversed course—at least a little—in its standoff with the county School Board over the funding of artificial turf fields at high school stadiums. Supervisors declined to impose the recommendation of its Finance and Government Services Committee to withhold funds until the school system agreed to cooperate with testing of three existing artificial turf fields in an effort to address health concerns associated with crumb rubber pellets used as a filler. However, they will continue to press for the testing. The issue will be front and center tonight when supervisors meet with the School Board to review its proposed Capital Improvements Program. School system leaders are seeking to accelerate funding to install new fields at the four high schools with natural grass in their stadiums. The board’s finance committee last month unanimously recommended that supervisors hold off on allocating money to install the additional synthetic turf fields until school leaders agree to permit the health tests. Concerns about long-term health risks association with crumb rubber have been raised—locally and nationally—in recent years, although no definitive link has been made to cancer or other illnesses. Supervisors and School Board members have examined a number of options, but concluded that the crumb rubber products are the most cost-efficient. Concerns about athletes’ health continued, however, and supervisors agreed to test the material used in field built by three different vendors used by the school system. The debate took a turn earlier this year when the School Board refused to grant access to the fields unless the county also tested grass fields, more than doubling the expense to the county. The two sides have been at a stalemate ever since. Tuesday’s vote to not approve the finance committee’s recommendation represented a softening on the supervisors’ stance. Only County Chairwoman Phyllis J. Randall (D-At Large) and Supervisor Tony Buffington (R-Blue Ridge) and Committee Chairman Matthew F. Letourneau (R-Dulles) supported the recommendation. Members on the majority side said they recognize the need—and the strong community support—to upgrade the final four fields and were unwilling to adopt a roadblock to those efforts. Supervisor Koran T. Saines (D-Sterling) led the contingent that wanted to press ahead with the health tests, even if grass fields were included. Letourneau suggested having the staff research alternatives to crumb rubber, including a turf product used prominently in Europe. Prior staff reports said that product would be more costly, but that may no longer be the case, he said. Both of those motions passed. That’s where the discussion is likely to pick up during tonight’s face-to-face meeting. In addition to request $8.3 million to install synthetic fields at Freedom, Briar Woods, Dominion and Heritage high schools in 2019, the School Board’s CIP $467 million to fund capital programs through fiscal year 2023.